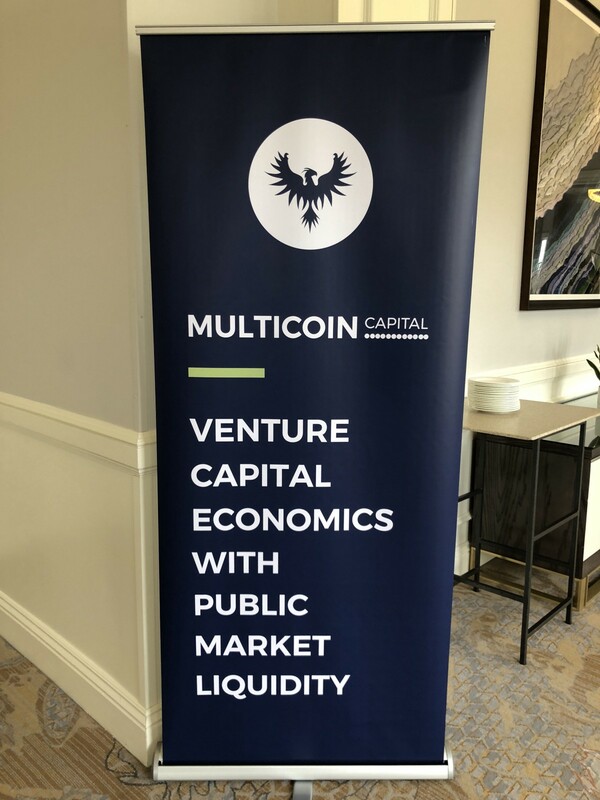 Last Wednesday, I spent the day at the annual meeting for Multicoin Capital. Multicoin Capital is one of the more active and visible “crypto hedge funds,” whose hallmark is openly sharing their perspectives on the crypto / blockchain industry, evolution of blockchain technology underpinnings, and analyses on specific crypto assets (like EOS, IOTA, XRP, REP). 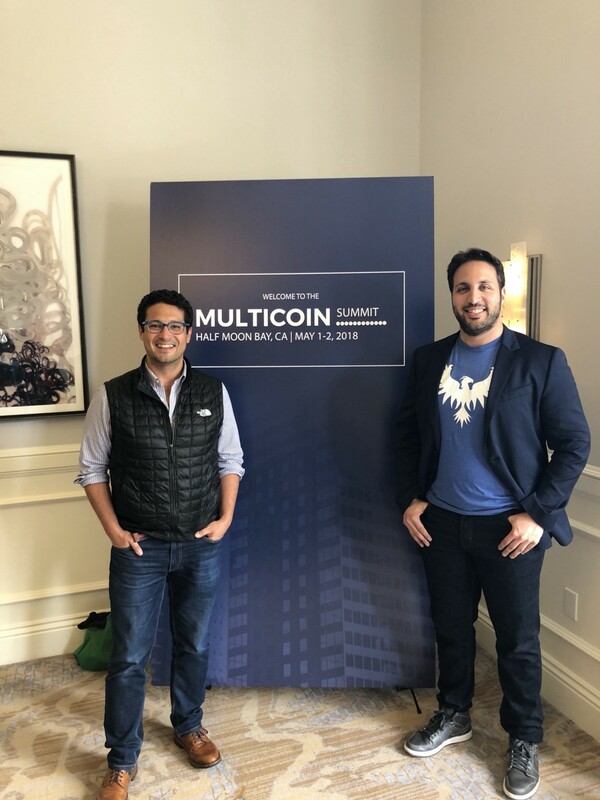 In a market that is commonly described as frothy and overhyped, Multicoin Founders Kyle Samani and Tushar Jain offer an open, rational and objective approach to their analyses and investments, which they share on their very active blog. Shasta Ventures is not an investor in Multicoin Capital, but the team is nice enough to have invited me among a small number of outside engaged people in the space. It was an incredible event, the speakers and attendees were leading entrepreneurs, builders and investors in blockchain today, including Vinny Lingham of Civic, David Sacks of Craft Ventures and Harbor, Ryan Selkis of Messari, Arianna Simpson of Autonomous Partners and Amitt Mahadjan of RareBits, among many others. Notably, and as a broad comment on the evolution of the overall crypto investing industry even over the past six months, there has been a real maturing in how crypto asset investors are approaching the market. Six months ago, I attended the Consensus:Invest event in New York in Dec 2017; notably at this time both BTC and ETH were at all time highs, BTC auspiciously crossed USD$10,000 the day of the conference, and it seemed you just couldn’t lose in Altcoins. There there was clear exuberance, cash was pouring in from everyone and their brother, and CNBC was running instructional segments on buying BTC across national television. I view this retrenchment as a good sign, a very strong indicator of a robust market in the making. Why is this good? As opposed to the developer community being the primary purchasers of crypto assets, institutional investors, family offices and traditional financial investors are becoming increasingly familiar in how (and why) to invest in the market as an asset class. Now, back to the insights from the Multicoin Capital Summit. Today, we are still largely in the infrastructure building phase (picks and shovels) to enable the promise of a broad decentralized “internet” and dapps. Big believers in the native token as the core of a smart contract platform — Dapp infrastructure is the key for any Dapps to be successful. Bullish to invest across many smart contract platforms because it’s still early, there is no winner/s yet. While Ethereum is the earlier leader with a very robust developer community, because of scaling concerns, lots of competitors are building to solve this problem. And this is one of the more interesting parts of the market, including projects like Tezos, Dffinity, Solana and EOS. Excited to invest across all projects and watch as developer mindshare grows around them. While crypto asset market caps are down, what hasn’t changed is developer interest, still seeing the smartest technologists in the industry moving into blockchain and building blockchain products. Major need for Dapp to support cross-chain flexibility; when BTC hit its peak in late 2017, simple transactions became incredibly expensive ($50 per validation), desperate need to leverage other chains that are more efficient, can’t be so dependent on one. Dapp developers should choose the base blockchain based on their application use case and their concerns such as, need for true decentralization, processing speed, anonymity, country dependence, etc. Strong belief that Non-Fungible Tokens, platforms like Cryptokitties, will be the first Dapps to acquire large mainstream user bases. An anecdotal example, 25% of Cryptokitties users have not previously held cryptocurrency. Equity would act as base ownership value in perpetuity (for this entity) enabling an investor to take part in any economics the company produces, offers, issues, etc. Beyond the economics that the equity will produce to investors, the equity itself may be rendered illiquid and unsaleable if a traditional “exit” never comes; make sure to plan for realizing returns along the way through token value or other means, not expecting M&A or IPO. It’s clear that most all “utility” tokens that ICO’d in 2017 are all securities; this should seriously halt the ICO market until SEC enquiries and enforcement actions come down. Tread very carefully if you are planning an ICO. Harbor is laser focused on ensuring that security tokens are compliant with federal securities laws; doing so through frameworks and code embeds into the blockchain to identify accredited investors, specific time lock ups, etc. In summary, it was an incredible day. The wealth of knowledge and collective experience in the room was very impressive, and illustrative of the bright future ahead for builders of and investors in blockchain and cryptoassets. Thanks to Multicoin Capital. — I invest in Emerging Platforms at Shasta Ventures, specifically technologies bridging the digital and physical worlds including AR/VR, computer vision, robotics and blockchain. If you’re working on something interesting in these spaces I’d love to chat with you. Find me on twitter @jacob.